World Cup 2018 is upon us, and with it comes the inevitable rush of pick-up-and-play football games. Soccer Slammers is one such effort, and it's pretty much at the polar opposite end of the Switch footy game scale compared to FIFA 18 - for better and for worse. On the 'better' side, it forgoes the dry, manicured pomposity of EA's fully licensed ball-hog for a much more approachable take on the beautiful game. It's ideal for those who only become casually acquainted with the sport every four years or so, or for fans who intend to become very well acquainted with vodka during Russia 2018. 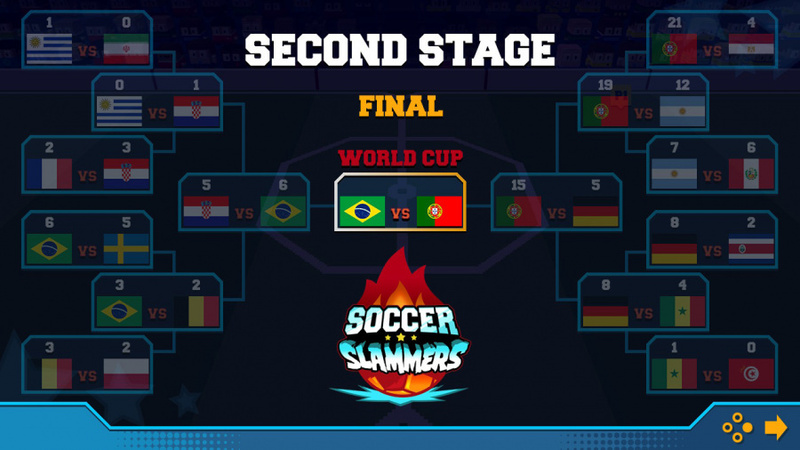 On the 'worse' side of things, Soccer Slammers is an incredibly light and almost throw-away experience; it lacks the nuance and sheer level of content required to keep you playing beyond the end of this summer's premier footy tournament. 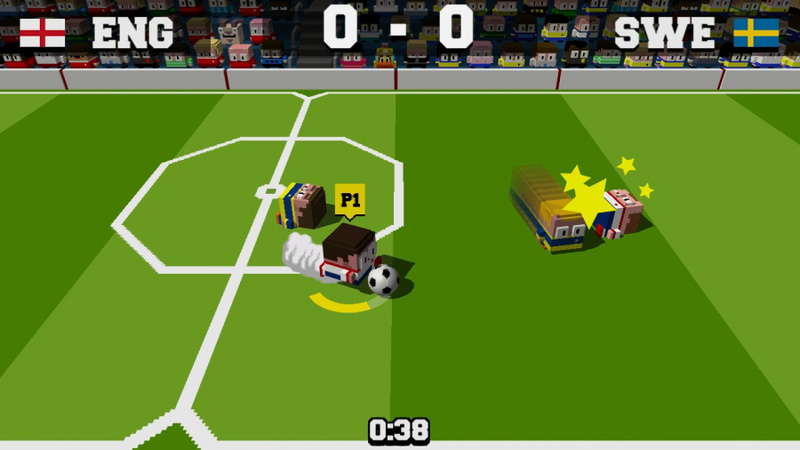 You don't need to memorise dozens of dubious tricks or switch formations on the fly in Soccer Slammers. This is simple 2v2 stuff, with only four controls to contend with: pass, shoot, tackle and sprint. You don't even need to worry about switching control between your two players in single player mode, as one member of your team will always be controlled by AI - though they will pass to you when you hit the appropriate button. The pitch is extremely compact and walled in, like a 5-a-side field or an ice hockey rink, so the ball is constantly in play. There aren't any stoppages for fouls either, as the very concept of illegal play is alien to Soccer Slammers; crunching into your opponent from behind with a bone-breaking challenge is positively encouraged. As a result, turnovers are common and dwelling on the ball is a surefire recipe for failure. When you receive possession you'd better get rid of it quickly, either with a shot or a pass, otherwise you're bound to lose control and momentum. Alternatively, you can sprint away from your opposing number with one of the right shoulder buttons, though you only have limited (albeit quickly replenished) stamina. Shots are chargeable, and a fully wound-up net-burster from an angle is highly likely to fly past the automated goalie, even if you're shooting from your own half. You'll swiftly realise that the key here is to gain yourself the time and space required to build up a humdinger of a shot, wherever that may come from. Your tactical options to this end are fairly limited. It generally pays to sit deep and invite your opponent onto your half, sliding in to take ball as they start to charge their shot. You'll then have ample space to run or pass forward. There isn't really the potential for a fluid passing game, as the entire system is heavily automated. You don't need to guide your passes towards your teammate, or even have your player facing the appropriate direction. It often pays to have your AI buddy pass straight back, though, as they're often prone to hitting tame shots straight at the opposing 'keeper. All of which is a roundabout way of saying that Soccer Slammers is a multiplayer game first and foremost. Sure, solo players can run through an approximation of the World Cup with any of the 32 national teams, but the game as a whole has blatantly been set up for two to (ideally) four players to take one another on. 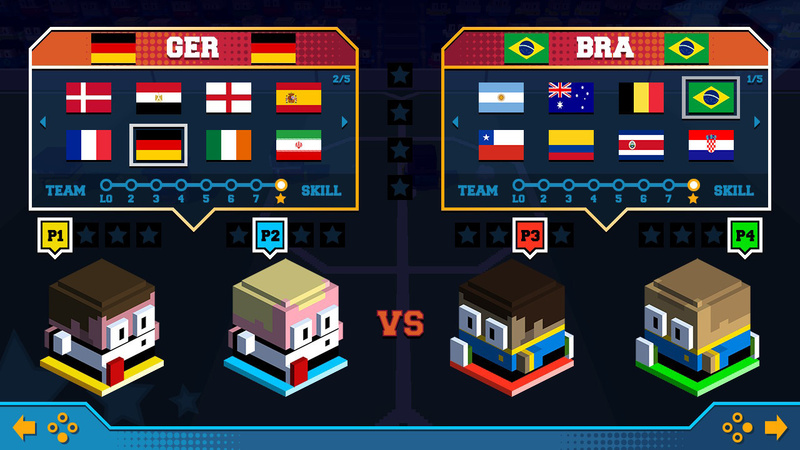 Full-on 2v2 with four Joy-Cons is where Soccer Slammers really comes to chaotic, scrappy life - although two players teaming up to take on the World Cup is a timely touch. Soccer Slammers is far from the complete football package, even within the confines of the arcade sports genre. 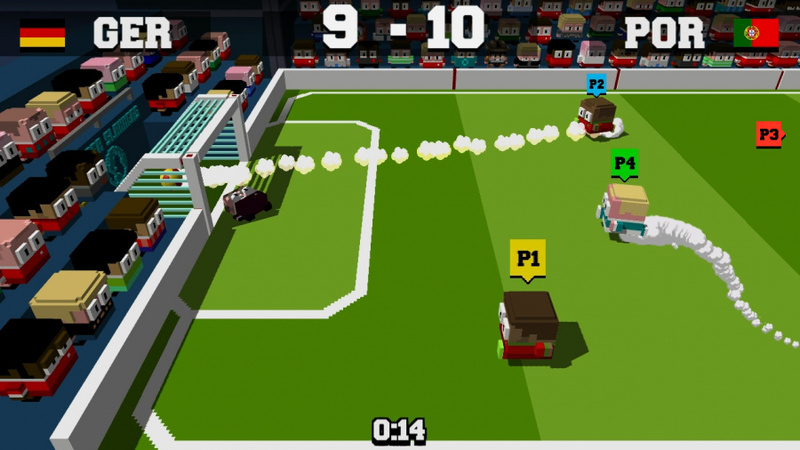 It's certainly no Mario Strikers: Charged Football (hint hint, Nintendo). But if you and your friends find yourselves with the odd 15-minute half-time interval to fill over the coming weeks, it could be the perfect footy filler. 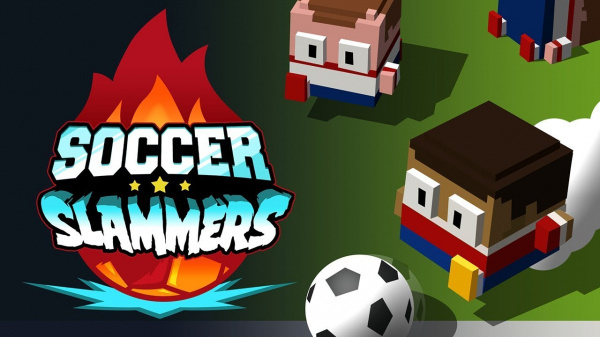 Soccer Slammers is a frenetic arcade football game that's extremely light on depth and content but high on immediate thrills. It's the ideal half-time snack, but it won't sate your hunger for a more meaty football experience. Thankfully, with FIFA 18 already available on Switch a more immersive experience exists, but if it's casual action you're after, this could the fixture you need. "Casual action" is exactly what I'm after. This is #1 on my list for the week. Can't go wrong with a new Atooi game. I can rack up crazy play times with simple arcade style games. Totes the Goat has become my go-to for a quick game and I've managed to put something like 30 hours into that silly title. I can easily see the same happening with Soccer Slammers. I love a fast paced arcade football game, but unfortunately I really can't stand the visual style of this one. I considered getting this but after being burned with Legendary Eleven last week I decided to leave it for now.Online play would definitely have swayed me. I did buy Super Sidekicks 3 though and it's quality. Foop (from Fairly Odd Parents) is playing football ! It’s not Treasurenaughts so who cares. Remember like 3 years ago when jools said he was focusing on Treasurenaughts? This looks fun, but no online will definitely cut back on my playtime. Still not a deal breaker, though, so once noon hits, it'll be on my Switch. @Pikachupwnage Atooi (then Renegade Kid) is a pretty small studio, so when anticipated sales don't bolster income or an idea for a game that originally thought would take two months to do grew into a much larger project or Jools changes focus to work on something naturally while he's 100% passionate about it (rather than force ideas through which, in a creative world, never works), quotes like yours become a different reality. Not all studios can afford to have teams of a dozen+ people working on multiple games. Yes, it has been about 4 years since Treasurenauts was announced, but Jools assured us 2019 is its release year and he even hired someone to work on the game fulltime currently. What's left for this year (as we know...) is Chicken Wiggle Rehatched on Switch, which is expected this Christmas holiday and since it was funded via Kickstarter, Atooi actually has an obligation to stay on schedule, another reason why Treasurenauts is 2019-bound. I'll probably buy it just to support the studio as I'm a big fan of Jools' work but don't really fancy this one. Nothing wrong with it, it's just that I only really enjoy sensible soccer as far as football games go. In a nutshell, Pokemon quest with a ball. @holygeez03 I loved Soccer Slam! Dammit, that and Monkeyball...I would explode! Hey folks! Could anyone tell me how many difficulty options there are in this game? Thanks! There are 8 levels of difficulty levels that you can use the slider with. I have this downloaded and I'm looking forward to it since I like most of Atooi's games. I put 30 hours into Totes the Goat which is very simple so I could see myself playing this for a bit as my go to pick up and play game when I just have a few minutes. @Realist That difficulty is also separated for your teammate's AI and the opposing team's. I'm liking the game the more I play. My first impression after I got slaughtered in my first game was "this is fun? ", but then I learned how the game actually works and the AI can be both quite competitive and fun! The goalie AI seems to be as dumb as a squirrel debating whether he wants to cross the road when a car approaches. I get that the point of the game is scoring, but the goalie AI is hilariously dumb. The logic center of my brain hates it, but in the spirit of the game, it's good for a laugh and adds to the game. I'd rate the game at the very least a 7/10.